Raise a glass to Mable Hoffman who has died at 88. I just read of her death in the Wall Street Journal. She is the goddess of the Crock Pot! It would take someone named Mable. Spelled that way, take note. Most people will be sloppy and write Mabel. But it is Mable! As in "table." 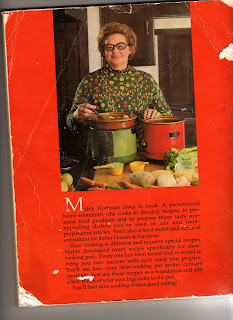 Mable Hoffman was a home economist and she wrote all those Crock Pot cookbooks I have seen in the Buffalo and Erie County Public Library when I have had the stomach to go there despite all the schufts and oiks who people the place. That is the back of one of the cookbooks pictured above. You have to love Mable Hoffman's shirt! Also her look. She had a saying and it was, "Never trust a skinny cook." I cooked dinner once for Leonard Pennario in a Crock Pot. I made beef stew. I should have called Mable Hoffman and told her how it went. Now, now, let's 'fess up - it's good for the soul. Re the library, is it the schufts and oiks, or the fines? Library is where the homeless go when shelters put them back on the street after 8 a.m. It is always later than you think. Prof. G, it is the schufts and oiks! And Anonymous and Larry, thanks for the wisdom.